Organized by Lincoln Laboratories, and with sponsorship this year from IBM, Cray, DELL EMC, Hewlett Packard, Intel Corp, MITRE, and NVIDIA, HPEC ‘19, was held September 25th to 27th, 2018. 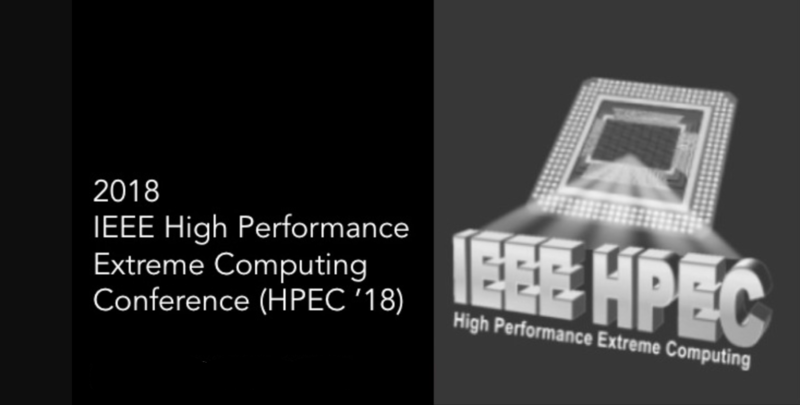 Since its beginnings in 1998, HPEC (the High Performance Extreme Computing Conference) has grown to become an annual fixture of the September High Performance Computing (HPC) calendar. Now the largest computing conference in New England and the premier conference in the world on the convergence of high performance and embedded computing, HPEC was originally hosted at Lincoln Laboratory, but since its 2012 incorporation as an official IEEE conference, HPEC has made its home at the Westin Hotel in Waltham, MA. The technical program included tutorials from industry and academic experts, demonstrations, poster sessions, and special events such as the DARPA/Amazon/IEEE Graph Challenge (a competition to encourage community approaches to developing new solutions for analyzing graphs derived from social media, sensor feeds, and scientific as they evolve in real time). 2018 champions included “Fast Triangle Counting Using Cilk” from Abdurrahman Yasar, Sivasankaran Rajamanickam, Michael Wolf, Jonathan Berry (Sandia), and Umit V. Catalyurek (Georgia Tech); “High-Performance Triangle Counting on GPUs” from Yang Hu (GWU), Hang Liu (UMass Lowell), and H. Howie Huang (GWU); “Update on Static Graph Challenge on GPU” from Mauro Bisson, and Massimiliano Fatica (Nvidia); “K-truss decomposition for Scale-Free Graphs at Scale in Distributed Memory” from Roger Pearce, and Geoffrey Sanders (LLNL).